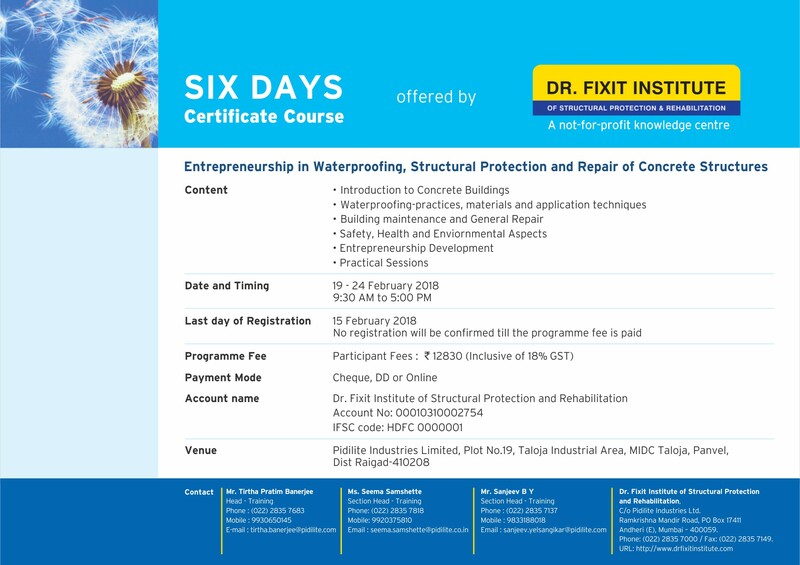 Dr. Fixit Institute of Structural Protection and Rehabilitation (DFI-SPR) is a not-for-profit knowledge centre primarily to act as a platform for “enhancing the service life of built environment through global sharing of knowledge and practices in the fields of Waterproofing, Structural Protection, Repair & Rehabilitation”. The Institute is promoted by Pidilite Industries Limited and is managed and operated on a stand-alone basis. It is registered under Section 25 of the Indian Companies Act, 1956. DFI-SPR accredited by National Accreditation Board for Testing and Calibration Laboratories (NABL) as per ISO / IEC : 17025 – 2005 in the discipline of Non Destructive Testing and Chemicals. One of the objectives of DFI-SPR is to bring and popularize the country with the global standards and practices of Waterproofing, Repair and Rehabilitation technologies. As a step towards achieving this objective, the DFI-SPR has been conducting several programmes all over the country for creating awareness and skill development in the field of Waterproofing and Repairs of Structures.